The T1 EZM 14 is a Mission Timer (EZM) for professional divers, and it features a 45 mm cushion case, designed to comfortably hug the wrist, made entirely of high-strength titanium. In recent years Sinn has developed a quite well-deserved reputation for making outstanding dive watches, largely due to the success and popularity of their U-series dive watches, whose cases are also contructed of a special material - German U-boat steel. However, dive watches also tend to be larger in size, and thus quite a bit heavier than what many people are used to, which can make them difficult to wear on a daily basis or when 'diving' around the desk. In order to create a watch that would accomplish all that is required of a professional diver, yet also be light enough to enjoy as a daily wearer, Sinn chose to create an all new case entirely of titanium. Titanium lends itself quite well to use in a dive watch due to exceptionally low weight, extreme strength and superior resistance to seawater. On top of the titanium case, an additional feature of the T1 EZM 14 is Sinn's Tegimented unidirectional captive safety bezel which features a unique design to ensure that the bezel cannot detach from the case or be rotated inadvertently. In other words, the bezel is held onto the case by a series of screws, and must be depressed before it can be rotated around the dial! Also, as a Mission Timer and part of the Sinn's EZM line of watches, the new T1 has been purpose built to withstand the rigors of professional dive use. As such, the watch has been fully tested by all European diving standards and certified by Germanischer Lloyd Hamburg to a 1000 m diving depth. On top of this, the T1 EZM 14 also features a number of technologies unique to Sinn that will ensure years of reliable service. This includes the Tegimented Captive Safety Bezel System mentioned above, but also their Dehumidifying Technology which uses a copper-sulfate desiccant capsule and inert gas to keep oxygen and moisture from entering the case in order to prevent the premature degradation of the lubricants and oils. These oils and lubricants are special as well, as Sinn has designed them to provide reliable operation in extreme temperature environments, from – 45 °C up to + 80 °C. A further aspect of the Mission Timer design is optimum legibility, and Sinn has employed a new arrow-haped minute hand, which is being used for the first time in a Sinn dive watch. This adds increased legibility to the dial, allwoing the user to quickly discern the time, even at a glance, due to the different shapes of the hour and minute hands. To ensure that this high level of legibility is also possible in the dark or in adverse viewing conditions, the T1 EZM 14 also features color-differentiated luminous paint for the minute hand and luminous triangle at 12 o'clock for clear reading of set time. The T1 EZM 14 features a matte black dial with date at 3, Super Luminova on the hands and markers, and a striking red seconds hand. Other features include a sapphire crystal with an anti-reflective coating on both sides, and a silicone rubber strap with matching titanium buckle. 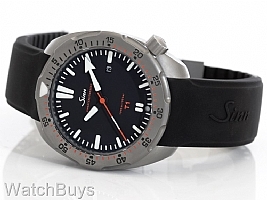 Due to the titanium case construction, the Sinn T1 EZM 14 weighs just 71 grams, without strap or bracelet attached.